How Did Bubbe Bake It? This hamantaschen recipe is a long time in the making. I first wrote about these three-sided cookies or hamantaschen in a very early blog post in March of 2010. As a child, I remember eating the baked scraps of orange-scented cookie dough voraciously with all three of my brothers. We didn’t even care about the fillings. But my grandmother’s “recipe” is scrawled on the back of a piece of paper with imprecise measurements. So I have been experimenting on and off trying to replicate that memory flavor. During one round of testing, I had orange olive oil in the pantry and decided to try it. My grandmother always made these cookies with vegetable oil so why not olive oil? And sure enough, it worked. But orange scented olive oil is not a prerequisite. Regular olive oil enhanced by orange zest works quite nicely. In fact, I use some zest for an extra hit of citrusy aroma even with the orange olive oil. This dough has a tendency to be very soft – a little refrigeration helps with that as well as some flour on your work surface. 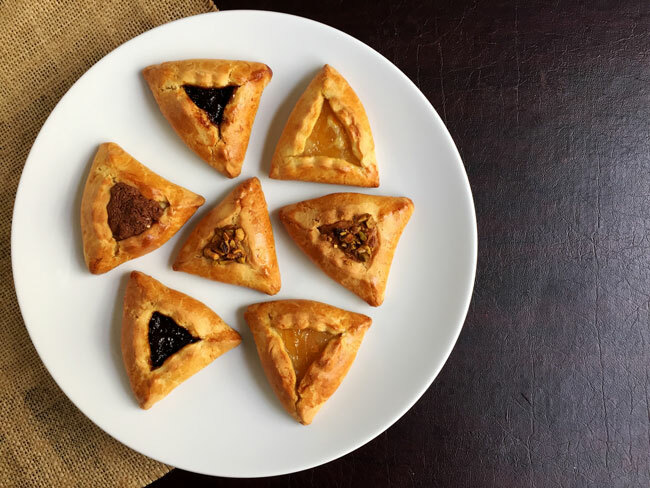 These three-sided cookies are traditionally eaten for the Jewish holiday Purim where we remember the story of wicked Haman and the hero Queen Esther who saved the day for the Jewish people. 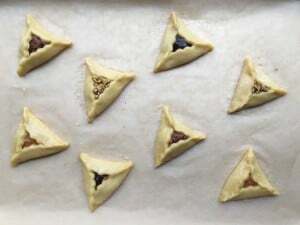 Many stories have been woven to explain the name of these cookies — tasch means pocket so these are Haman’s pockets or the triangular shape represents his hat. In any case there is a pocket that is created for the fillings – almost anything will work from traditional fillings like poppy seed or prune or unexpected fillings like Nutella, chocolate ganache, or any jam of your choice. One recipe I discovered places cookie dough in for the filling so you end up with a cookie in a cookie. Favorites in our house are jams of any kind. 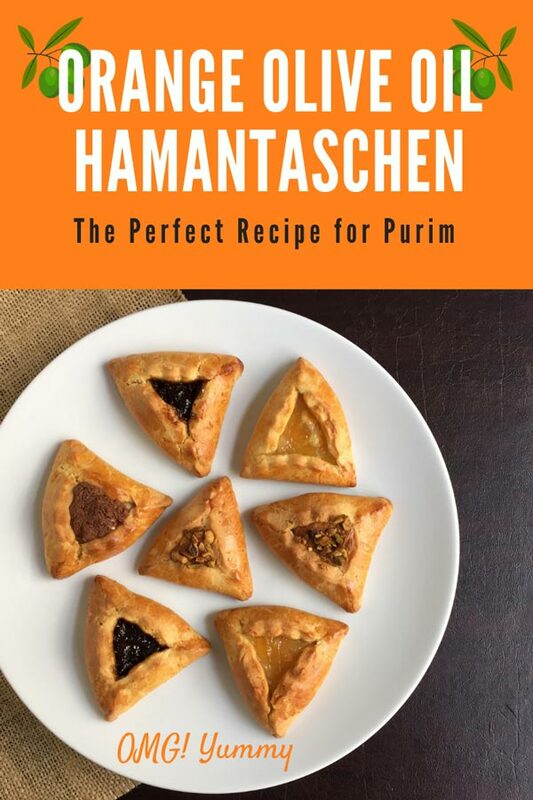 Be sure to visit my Purim Pinterest board with lots of creative ideas for hamantaschen and other Purim goodies to fill your Mishloach Manot. Mishloach Manot are the traditional baskets of goodies that people leave for friends and family during this festive spring holiday. 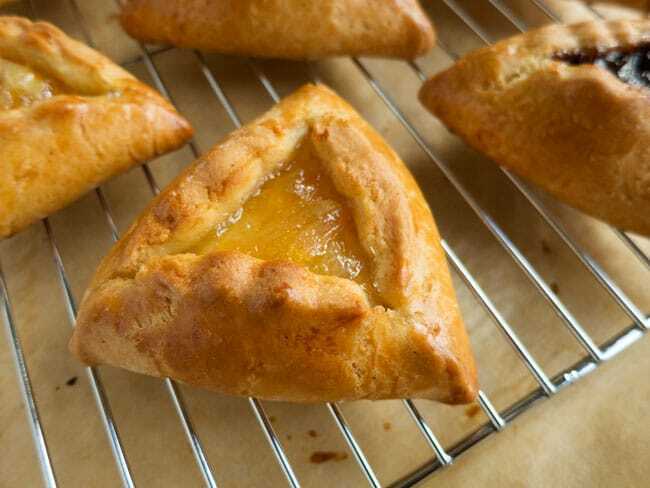 Have you eaten or baked hamantaschen before? What type of dough do you use and what are your favorite fillings? This recipe is inspired by my grandmother's recipe-less baking. 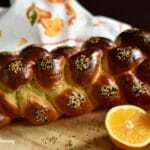 In an attempt to recreate this childhood memory flavor, I have been inspired by many recipes including Irene Saiger's of the blog Bamitbach and Marcy Goldman's Jewish Holiday Baking Bible. I enjoy baking with olive oil so I chose to use that here instead of vegetable or canola. This dough comes together easily and is served well by time in the refrigerator so you can make it ahead of time and then prepare the cookies later. For the olive oil selection, use a mellow olive oil (low-intensity) – even extra virgin – but don’t use your most expensive intensely flavored bottle. In a medium sized bowl, whisk together the flour, cornstarch, salt, baking powder and baking soda. In another medium sized bowl, add the sugar and orange zest and use your fingers to rub the zest into the sugar until it is mixed throughout. Then add one egg, olive oil, orange juice, and vanilla. Whisk these wet ingredients (and sugar) until thoroughly combined. Then incorporate the wet mixture into the flour mixture to form a dough. Use a wooden spoon or spatula to combine and get your hands in there if need be. But it will come together easily. It may be a bit wet - that's ok. Refrigerate it for a half hour (or more) and then be sure to roll it out between two pieces of parchment. Parchment is so handy for wetter doughs and you avoid adding too much flour to prevent sticking. While the dough is chilling and resting, prepare your cookie sheet with parchment or a Silpat type of liner. Also prepare your fillings and your egg wash. Preheat the oven to 350 degrees. Take out 1/2 the dough at a time from the refrigerator and roll it out on a floured work surface to about 1/8 inch thick - really as thin as you can roll it without it falling apart. It doesn't have to be perfectly shaped as you roll it, just fairly even in thickness. 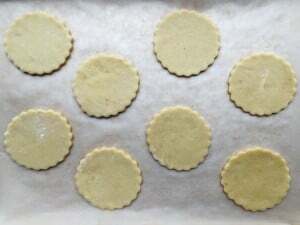 Use a 3" or 2.5" round cookie cutter to cut out as many circles as you can and place them on a parchment lined cookie sheet. Then using a pastry brush, brush each circle with egg wash and then place a scant teaspoon of filling in the center. Then using your hands, cinch up the dough to form a triangle (see the video above) but once you cinch one side, the rest becomes easy but be sure to close it firmly so it remains closed as it cooks. After your have filled and formed each one, brush each cookie with egg wash and if desired, you can sprinkle with a bit of sugar - totally optional to your taste. Bake at 350 degrees for 18 minutes. Remove and place on a cooling rack. Enjoy with a cup of coffee or tea or deliver to your friends in a festive Mishloach Manot basket. I gave this recipe a try, and didn’t have any problems with the dough. I used some nectarine jam for the filing, which was yummy. Nectarine jam? Well that’s a little taste of summer in the early spring! Thanks Martha. We don’t have many of my grandma’s recipes because she baked by feel and she never learned to write in English so it is precious indeed. These Hamantaschen are truly Yummy! Made again this year as Beth’s recipe is a family favorite. Played around with different fills which was a lot of fun. Bravo, Beth! 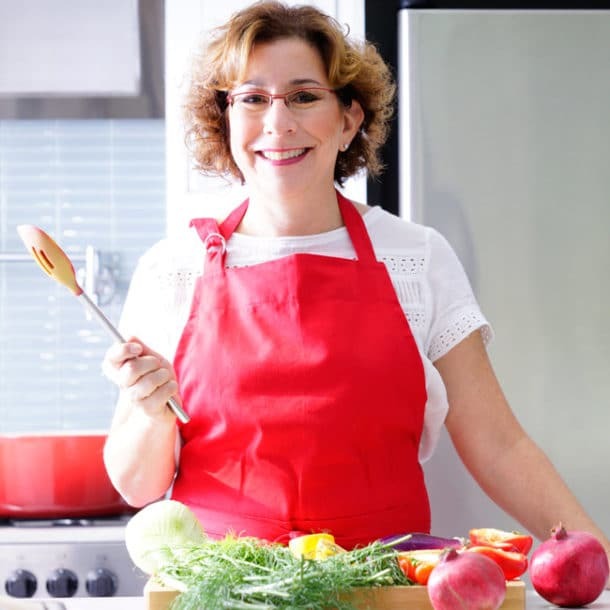 You are the filling queen Susan! So much fun to play around. 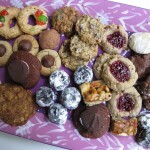 Beth, I made a double batch of this recipe last weekend and Bruce and I delivered cookies to friends and family. The reviews are in – make these again! I used an every day olive oil and fresh orange juice and zest. I used jam – a fig jam made by one of my good friends in half of the cookies and a blackberry rasberry jam I got in Friday Harbor last year in the rest of the cookies. I will definitly make these again. Thank you! Thank you for sharing Gretchen. Your jam options sound fantastic. I am so glad you enjoyed and that you shared. I have my test batch in the fridge staring at me to make a few more and use up the lekvar and apricot filling I made plus some Gregory jam. I can attest that these Hamantaschen are fantastic! Hi. 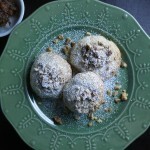 I made the dough for these last night (as written), but the it never came together—total crumbles. I scraped it together to rest overnight, but that didn’t help matters when I tried to use the dough today. The best I can do is try to push the dough into trianglular shapes and bake them as shortbread-like cookies with a dollop of filling on top. Did this ever happen during your experimental phase? This is exactly what happened to me. I’m an experienced baker and I’ve used oil dough recipes before. I was excited to try this one but wow, what a complete disaster. I made two batches, just in case I missed something the first time. However, both were a complete mess. I tried adding additional oil to the second batch so that it would at least form up, but even after resting in the fridge, it would simply not roll flat without cracking all over the place – not just the edges. I could neither get it thin enough to cut, nor would I have had much surface to work with. Dear Clara, as I said to Ellie – I am sorry this happened to you. I truly appreciate the feedback. I just made them last weekend, as I do every year, and the dough was a little crumblier than previous times I’ve made it but it came together fine when I rolled it out – I often roll out my cookie doughs between parchment. Not sure if that would have helped. I’ve tested this recipe many times so I am at a loss as to why it didn’t come together at all. I wonder if the zest has anything to do with it though can’t imagine it making it not come together at all. We even made a different dough that same day – butter based and while this one was a tad more difficult to work with, it came together and tasted really good – better than the butter-based version. I love baking with olive oil in so many things. I know my grandma used vegetable oil and not olive oil but that was my nod to modernizing the recipe. I wonder if the viscosity of different oils might be part of the problem. Dear Ellie – I am sorry this happened to you. I just made them last weekend and the dough was a little crumblier than previous times I’ve made it but it came together fine when I rolled it out – I often roll out my cookie doughs between parchment. Not sure if that would have helped. I’ve tested this recipe many times so I am at a loss as to why it didn’t come together at all. I appreciate the feedback. We even made a different dough that same day – butter based and while this one was a tad more difficult to work with, it came together and tasted really good – better than the butter-based version. Dear Ellie and Clara – just spoke with a pastry chef and an olive oil cookbook author – could be that the gluten didn’t develop enough – that’s why it was crumbly. I will experiment to figure out the problem because I promise you this dough is delicious and works. Maybe the order of liquids added didn’t allow the gluten to develop (and I can address that in my instructions) or I can suggest some kneading if it doesn’t come together. In any case, I take your feedback seriously and care how your baking projects come out and I just want to make sure you know that. Chag Sameach. 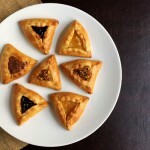 I’m making some for Purim on Friday afternoon…do you have a prune filling recipe you could share? I have lots of yummy jams and chocolates….I see prune recipes and they require a pound of prunes…..(that’s a llot!!!) I also like poppy seed but cannot find any poppy seed paste in the stores….would you like to bake with me? ;> The more the merrier! I have been very busy with my blog and a couple of clients so I don’t know if I can break away to bake, though I’d love to. I did make my own prune filling last weekend. Here’s what I did: I used 1/4 lb of prunes and it made plenty. I covered them with hot water and let them soak for a bit then I boiled them, low boil, for a bit to really soften them up. Drained them and put them in a mini cuisinart but you could use a regular one or blender. Added some lemon zest (orange would also be good), couple teaspoons of orange juice, and tablespoon of sugar. Blitz it, taste it, adjust, blitz again. I did the same with apricots but used honey instead of sugar. Next time, I might add in some aromatics while they boil – maybe cinnamon or cloves. But not necessary. I’ve been making hamantaschen since my children attended Jewish day school. I love the cookie dough orange juice and zest flavor. I’ve never used olive oil but I prefer making them parve with vegetable oil and I’m sure good southern Italian or Spanish olive oil enhances the flavor. My family prefers mini dark choc chips mixed with cinnamon sugar to fruit filling but I’m a fruit filling lover. Given I’m the ancient Bubbe of 8 I only make what the children prefer. I actually have made my own apricot and prune filling in the past to make sure no corn syrup was mixed in with the lekvar or apricot. We lost that family member. I’m anxious to try your recipe. So good to get your message Stephanie. I think chocolate chips with cinnamon sugar sounds quite good – a little like a cross between rugelach and hamantaschen! A bubbe to 8! How lucky those 8 grandchildren are :-). Let me know how you like the recipe and what fillings you decide to use. Can’t believe it’s almost Purim already! What a treasure to have your grandmother’s hand-written recipe! It looks like you’ve recreated it beautifully. I like your use of olive oil. Favorite fillings in our house are all sorts of jams and chocolate. Years ago I tried a recipe featuring a chocolate dough and peanut butter filling that was pretty tasty. These are certainly versatile little treats. I hope you enjoyed a fun Purim! 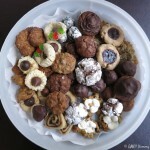 I thought about trying chocolate in the dough – next year :-). The olive oil makes the dough very soft but with the right amount of flour and a little refrigeration, comes out pretty nicely! I just love all the jam fillings. Thanks, as always for stopping by. Great to hear from you Jael. How is everything in Israel and with your blog? Will head over later today for a visit (I wish to Israel but for now, just your blog)! We LOVED the old recipe on the paper, it looks like many of our recipes from our parents which they wrote down back in the 60s and early 70s. Lots of treasures there. As for using olive oil in desserts, it does make the dough a bit softer, so you’re right, you do need to refrigerate it before handling it, great advice. Thank you for another delicious idea Beth! Sending you lots and lots of greetings from Athens! XOXO to you both as well. I hope you had a lovely Easter. We enjoyed the sunshine and some nice family time yesterday – which is rare these days with everybody’s busy schedule. Olive oil is a joy to bake with but it does require a bit of adjustment. Took me a few tries to get the dough right. My favorite part of the cookie is the fillings, especially the jams. 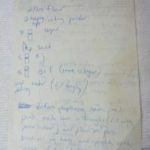 Re the recipe – if only I had had digital technology when I watched my grandmother make them but alas, so long ago all I could do was write down what I saw. I probably could have taken film photos but back then, we didn’t always have a camera with us. Just glad I’ve come close to recreating it! Hamantaschen is a pastry I’ve wanted to make, but haven’t ever given it a try. There are so many different fillings too! The video makes it all so easy! A great post Beth! I know you would come up with some wonderful filling choices Deb! thanks for stopping by. Glad you liked the video. Thought it was the best way to show the technique.